The fire at the Palace of Industry was an unexpected event for all of us. Many of us were very concerned for the future of this beautiful historical building, which has played host to fourteen Book World Prague 2009 international book fairs. Thanks to the dedicated and very professional work of the fire service, the central hall, the right wing and the whole of the palace's foyer have been preserved undamaged. We should also compliment the builders, who in their construction of the building 200 years ago took fire-prevention measures which served their purpose very well. In place of the left wing, which perished in the fire, Incheba Praha s.r.o., lessor of the Palace of Industry, has erected a prefabricated, air-conditioned hall which is highly suitable; it will be joined to the foyer in front of the left wing. To access the left wing, fair-goers will again be able to make use of two entrances. Book World Ltd. confirms that the 2009 (15th) BOOK WORLD PRAGUE international book fair will be held as previously announced: from 14 May to 17 May 2009 at the Prague Exhibition Grounds in Holešovice. Following the destruction by fire of the left wing of the Palace of Industry, Book World and Inchebou Prague (the company which lets exhibition space) undertake to find a suitable replacement for the space which is no longer usable. The central hall and the right wing will be working as usual. We will inform you withour delay as soon as a final decision has been made on the replacement exhibition space to be used. Although each international book fair is unique, all book fairs aim to create a climate for successful business negotiations between exhibitors and visitors. Book fairs draw attention to new releases by publishers and booksellers, and they showcase companies and institutions active in the book market and culture. 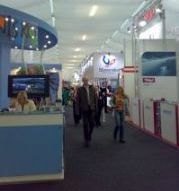 Like other international trade fairs, Bookworld Prague balances commercial and educational goals. The first day of the fair is reserved exclusively for trade professionals and members of the press. Every year, the main organiser of the book fair - The Association of Czech Booksellers and Publishers and its production company Svět Knihy, Ltd. - focuses on attracting as many booksellers, librarians, information professionals, literary agents, and representatives of publishers and printers as possible. Every exhibitor will have the opportunity to meet a potential business partner, and should feel assured that the maximum has been done to fulfill their needs. The presence of an international spectrum of exhibitors and visitors at the book fair is especially important for managers of Czech companies, who can observe world trends in the profession and display their new releases to foreign vistors. Exhibitors from abroad will gain greater familiarity with the Czech book market and the demands of Czech readers, which may inspire negotiations concerning copyright issues or book export. Bookworld Prague is very popular among the general reading public. It features numerous programmes for visitors: professional seminars and conferences, meetings with writers, author readings, presentations by publishers, and awards ceremonies for outstanding publishing and creative achievements. On a humorous note, the Translators Guild presents the annual Rack Anti - award - a prize for the worst translation of a foreign work into Czech. The book fair is held in the Industrial Palace at the Prague Exhibition Grounds. Built for the Provincial Jubilee Exhibition of 1891, the Art Nouveau palace is dominated by its central hall, and features two wings. The total exhibition area of the palace is 10,000 square metres, and the exhibition grounds offer flexible solutions for larger exhibition areas.